Hollybeary Creations : YNS Feb Release Blog Hop!! YNS Feb Release Blog Hop!! It's time for our February Release Blog Hop at Your Next Stamp. 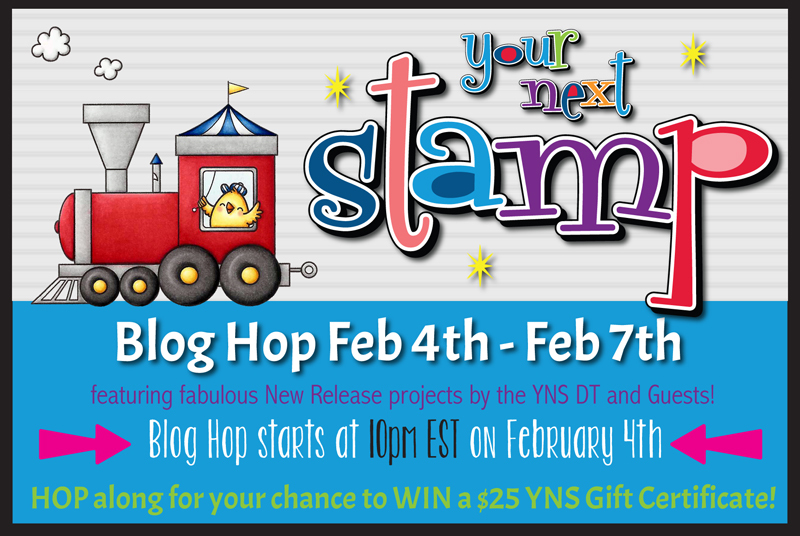 Be sure to Hop along with us for a chance to win a $25 GC to the YNS store. I'm using the new set All Aboard and All Aboard Train Carts... These sets work perfectly together. I used some Fun patter papers for my first card and then I watercolored the image using the same colors from the paper. There's also a chick from the Merry Christmas Chickie set. There's also a fun new Train Track Die in the store too! 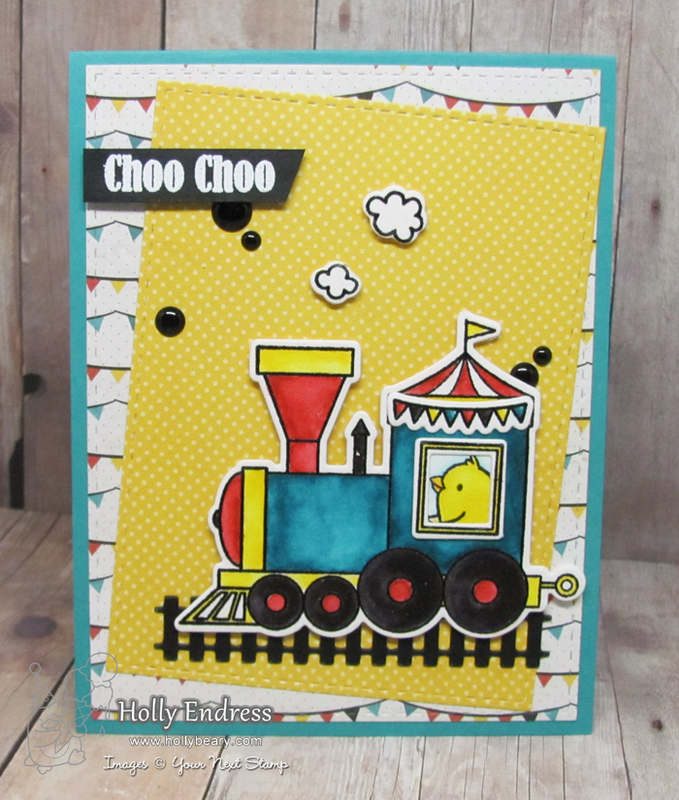 My second card using the Add on set All Aboard Train Carts. I created a background with some Distress Inks and then I stamped the images onto a piece of watercolor paper and colored them in. I stamped the ballon from the Birthday Phoebe set and used the coordinating die cut. All the February Products are now available in the store.. And we have a special Discount for you!! Are you ready to Hop along and see all the Fun new products that are available? So cute, Holly! I love the little chickie engineer!! 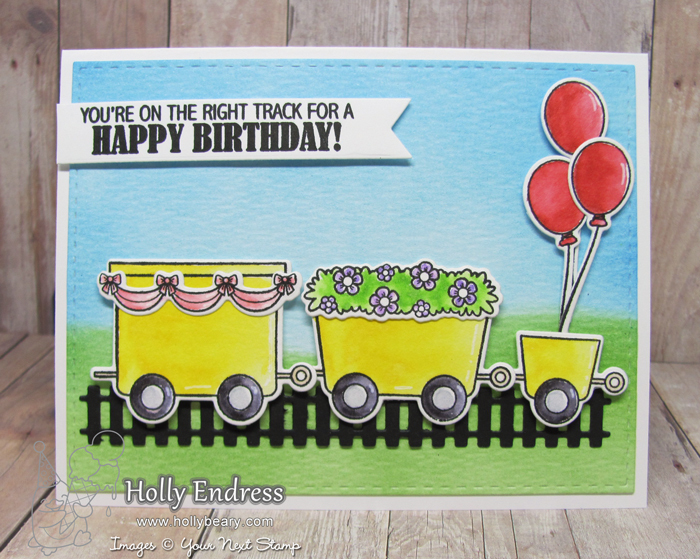 Holly, your use of the train collection in your cards is so well portrayed. The vibrant colors are so eye-catching. . .anyone would enjoy receiving one of these cards. Thanks for sharing. Adorable cards. Love the bright colours. Perfect for a kids birthday. I love how you masked and put the little chick inside the train! Thanks for the share! your choo choos are so cute and colorful! Hi Holly!!! 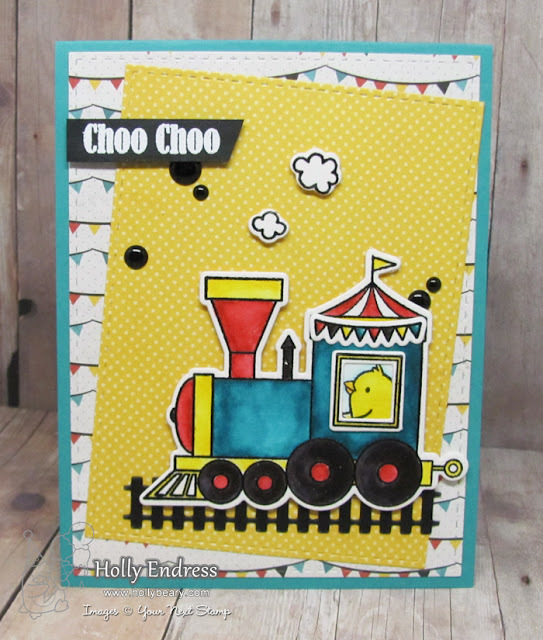 I love the layout of your cards, and that bird driving the train, adorable. Great color choices also. Thanks for sharing. What an awesome card and wonderful release !! These are both gorgeous cards and loooooove the colours and layout! The trains are so cute! It takes me back to when my oldest son was young. We had trains everywhere! Super cute designs. Great coloring! Cute cards. These train stamps are fabulous! Love that little chick driving the train! Love the way you use the train sections. Great colorful cards. I love all the ideas in this hop for the train set! All the cards are so different but awesome. Love the bright colours in your first card. Great cards, this set is so versatile. Great coloring and I like the choice of papers on the first one. The rich colors in these cards make them so appealing. Thanks for sharing them. Your cards are super adorable! Love them both! Colorful and CUTE - gotta love that chick at the wheel! Your cards are wonderful. Great coloring and I love the train. Love the colors in the train. Super cute! I am loving these train sets! These cards are super cute! I love these sets and you are right, they go perfectly together! Thank you for sharing. Fun layers and details on your sweet cards! Love the chickie driving the train! And the second is a whole different look all dressed up in flowers! Very cute train cards...love the chick conductor. These are so bright and fun Holly! This train set is very cute! Great job showing off it's different elements. Such cuties Holly. I love the track.